Hello, welcome back to another Florida adventure. Without further ado I will dive straight into pre travel day…. The start of our day was pretty normal, aside from the suitcases and mounds of clothes everywhere still to be packed! Charlotte goes to nursery on a Tuesday, and Martin was at work although was planning to finish at lunchtime. He headed off early while I got her ready and dropped her off before popping home to do some last bits before my nail appointment. 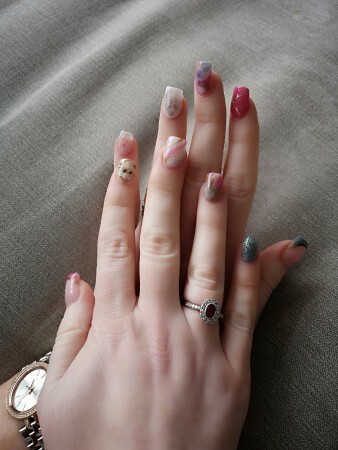 I work in a hospital and am not allowed to have nail polish on at all, so it’s a nice treat to get them done for holidays! Unfortunately, it took longer than I thought so by the time I left at 12:30 I was way off my schedule! Inspired by It's a Small World! I still had to get home, wash and dry my hair and finish packing, plus I had a list of jobs I still needed to get done around the house. This always seems to happen on pre travel days! Thankfully, by the time I got home Martin was there (having popped into Tesco for some hotel snacks!) so we were able to divvy up the list of things we still had to do and be ready for 3 when my Dad was picking us up. 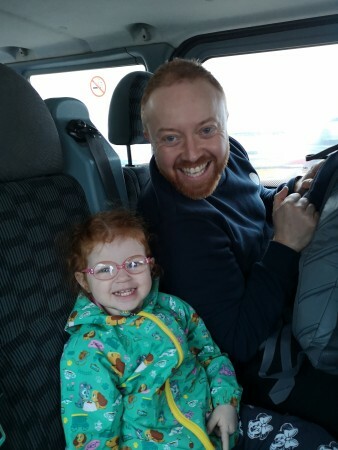 They crammed the luggage and stroller into the car and we set off to collect Charlotte from Nursery. When I went in she was so excited to see me (nothing to do with going on holiday, she was just happy to see me!) But her excitement went off the charts when I reminded her where we were going to next. I changed her clothes, she waved goodbye to her little nursery friends and the nursery staff and we were off! The journey was uneventful, and we were at the Airport (well in the general area) in about 30 minutes. There are 2 Premier Inn’s at Manchester Airport - Runger Lane North and Runger Lane South. As we pulled in I got so confused, we had booked North which is the same one we stayed at last time, but when we saw the 2 hotels I was so convinced we had stayed at the other one last time! Martin said no, and when we actually entered the hotel it became clear that he was in fact correct. So weird. Anyway. My Dad helped us in with the luggage and we said our goodbyes. I always feel sad saying goodbye to my family, even when we’re going away on an exciting holiday - it never goes away. Anyway, pulling myself together, we headed to the little self check in terminals. I always find the staff here so helpful, one guy helped us get sorted and told us to go up to the room and he would take care of the luggage which was a massive help. By now Charlotte was whining to get out of the buggy and we were laden down with all sorts and getting a bit short with each other. Ah, holidays! Such magical times. 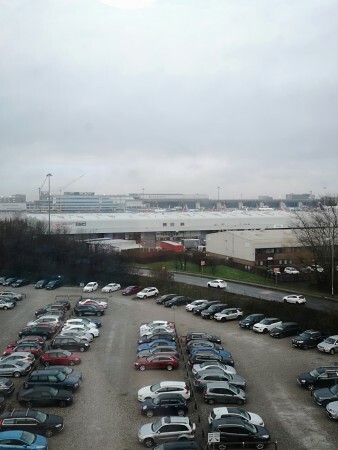 So we headed up to our room which was on the top floor, room 606 which had a fab view over the airport. Moments later there was a knock and the man delivered the luggage for us. 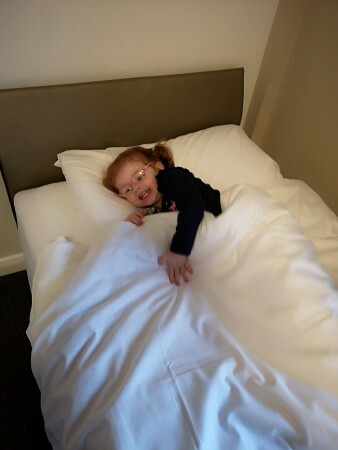 We got settled in, I unpacked the stuff we would need for the night and Charlotte enjoyed playing “going to sleep in the little bed”. There was a menu for the Thyme restaurant in the room, we had a little browse and there was loads of things we fancied. The menu had a “Tastes of Asia” section which all sounded delicious. I suddenly realised I hadn’t eaten all day! Get me some food! So down we went, and were seated right away. Charlotte did some colouring while we looked at the menu (again). He had a beer and I had a wine. 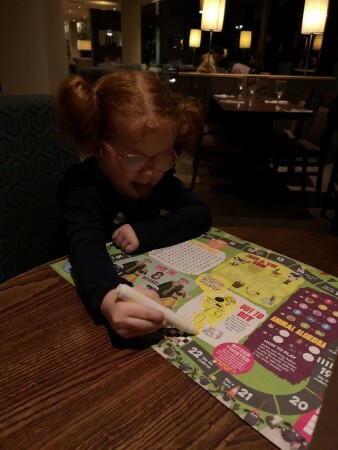 Charlotte had garlic flatbread, chicken meatballs and pasta from the kids menu with a fresh orange juice. Everything we had was really good. We did have to “encourage”(ie bribe) Charlotte to eat some of her dinner, as she was too excited and distracted. 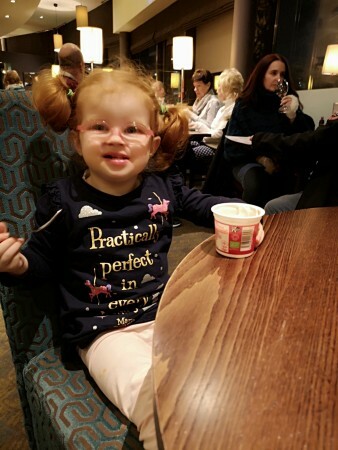 As soon as we said she couldn’t have her pudding of a yoghurt unless she had some dinner she got cracking! We had another drink and soon we were all finished and happy. Back up in the room I ran a bath for Charlotte and decided I may as well get in too. She was a bit disgruntled not to have any bath toys, but we had great fun playing with plastic cups and a make up blender sponge thing! Martin got her dried and into her PJs. 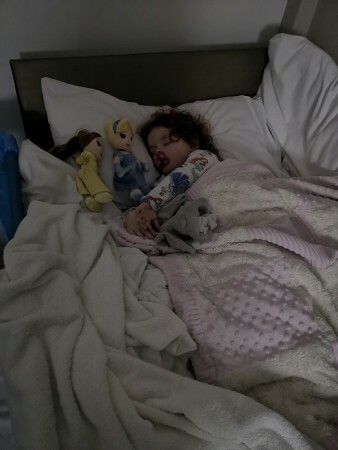 She hasn’t long been in her toddler bed at home, maybe 2 weeks? At home her bed is about 3 inches off the floor so we haven’t been particularly concerned if she fell out. Here though the beds are normal height beds, so the plan was to have her in the middle and push the little bed up to the side with one of us sleeping in that. She immediately blew that plan out by insisting she wanted to sleep in the “little girl” bed “all by myself”. Great. I padded her out with some pillows but still wasn’t happy (yes I’m neurotic) so I moved the travel cot next to the bed to sort of pin the pillow there in case she rolled. I felt happy she was secure there, so she had some milk and we turned off the lights for her to fall asleep. Which clearly didn’t happen. She was so wide awake still, and singing and chatting away in bed. We’d ignore her for a while, then try and shush her and tell her to go to sleep. She’d go quiet for a while, then start again. She had also had a nasty cough and cold so was coughing too. Eventually she coughed so much she made herself a bit sick. 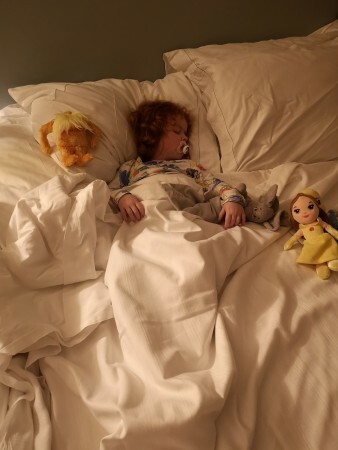 I flew out of bed and sat her up, doing that damage check that Mums do in that situation – Dumbo was unscathed but there was some on her PJ top and her little blanket that she likes to sleep with. I whizzed her top off and gave her a big cuddle, she’d really frightened herself and was having a good old cry. Eventually she calmed down so I put a spare T shirt on her and she settled down very quickly this time and went right off to sleep. I managed to get the blanket away and tried to give it a wash with some shampoo in the sink in the bathroom. I did have travel wash but had no idea what suitcase it was in, and knew I’d be able to wash it properly in the laundry once we got to Beach Club anyway. 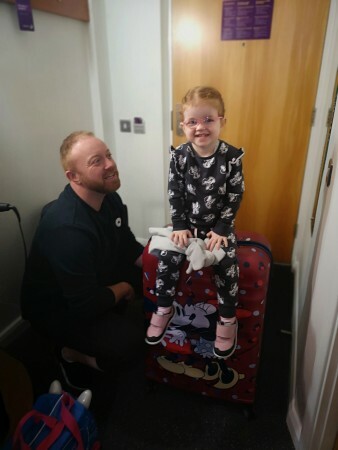 Martin popped down to ask the staff to keep her milk in the fridge overnight, and he booked our taxi for the following morning to take us to the airport, which is £8 and takes about 30 seconds haha. Once he was back, we put the TV on and had a few snacks. I think we watched 24 hours in A&E before going to sleep relatively early – not feeling quite as relaxed as I’d hoped! We were really hoping Charlotte being sick was just on account of her being worked up and coughing and that she wasn’t ill. I woke at 5, had a quick drink of water and went back to sleep. Thankfully we hadn’t heard a peep out of Charlotte so that was a big relief! Bizarrely at 6am the TV turned itself on, which I assume was some kind of wake up call but so annoying when we hadn’t set it. Martin went back to sleep but I stayed awake then, as the alarm was set for 7am anyway. Once the alarm went off me and Martin got up and sorted as much as we could, before waking Charlotte up. She’s never very impressed at being woken when she isn’t ready (can’t imagine who she gets that from) so we try as much as we can to kid her into thinking waking up is her idea. Today I opened the curtains at the end of her bed and we put CBeebies on the TV on low. Did the trick no problem and she woke up in a good mood. When I opened the curtains I had noticed something that could be a problem. Fog. Of all the things I’d been worried about, snow, terrible winds, drones. No. Fog. 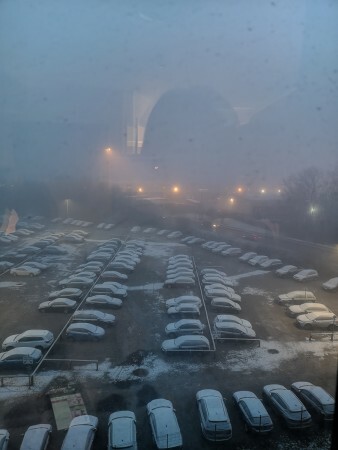 Where the airport had been the night before was all hidden in a thick soup. I tried not to panic too much, as our flight was only 11:35 so I figured it had plenty of time to resolve. I gave Charlotte some breakfast, a banana, little bag of cereal and a croissant while we were getting everything packed up. We finished getting ready and did a room sweep to make sure nothing was left behind. Charlotte enjoyed “going to bed” in the wardrobe. I don’t know. Toddlers. Once all sorted I wanted to recreate the photo I took as we were setting out on our first Disney adventure. We managed to get all the cases downstairs. The taxi was booked for 8:30, but hadn’t arrived by 8:35. A driver came in and asked if we were from room number (I can’t remember - not our room anyway) We said no, he asked what room we were, so we told him and he checked the little sheet the Premier Inn people have with all the bookings. There was another man waiting too and he said we could both jump in with him. He seemed to be driving one of the little shuttle buses rather than a cab, which to be honest was great with all our luggage! He dropped us all at T2, but the man seemed to be needing another terminal so he directed him where to get the bus from. Bit odd. I forgot that in T2 you need to get the lift up to Departures which is a bit annoying. Anyway we made it, and a lovely Virgin employee got us all checked in. She gave me a big plastic bag for the stroller for when we gave it in at the gate. Back in the lift now to go through security. We got pulled to go through the special assistance lane as we had the stroller, this line was much busier than the normal security line! We had tried to be as organised as we could, but I always feel stressed getting through here with Charlotte. Come to think of it it’s always stressed me out, it’s just a bit worse now! Once all our bags and everything were in the trays I took Charlotte out of the buggy so Martin could fold the it and give it in. I walked through the scanner (not the body one, as I had Charlotte with me) and beeped. One of the security staff asked if I was travelling with anybody, so I said yes my husband and gestured over to the queue where he was waiting for the body scanner. He thought I pointed at someone else, and pulled some random man through the line to give Charlotte to! I was like “Er, no I don’t know him – THAT’s my husband” Martin has no clue what’s going on at this point, eventually comes through and I have to pass her over while I take my shoes off and go in the body scanner. A female officer goes over me with the wand as well and says it’s my Alex and Ani bracelets that have set the detector off. By now the trays with all our things and bags have long gone through and I’m starting to freak out having read stories of people’’s stuff getting stolen! So we quickly dash over to the end of the line and grabbed all of what we recognised as ours. I settled Martin and Charlotte down on some seats and he started repacking while I went off to look for the rest. The buggy was ready shortly so I took that back to him. 2 of the bags had been pulled for extra screening. One, the lady said a pack of baby wipes in there may have looked suspicious on X ray. The other item that got pulled was Martin’s wallet. This was because he had this little card in there that did all kinds of things like a bottle opener, etc. She said they aren’t allowed because they are sharp. So she chucked it, which was fine and we were good to go! Except that as we were walking away I noticed we were missing our little clear bag of liquids for on the plane. I looked in all the trays waiting to be collected but couldn’t see the bag. I asked someone and he said he would have a look for me. He went up to the top where we had decanted everything into the trays, and they were sitting there on the side. When I handed them to the security guy he just put them down and not in a tray. The man put them in a tray and sent them through the scanner but didn’t apologise or anything. Eyerolls. FINALLY we were done, felt like it took about 8 days to get through. Into yet another lift (really, who designed this terminal?) we were finally in the departure lounge. We took Charlotte into WH Smith to choose a comic, I got some mints but they didn’t have my traditional plane journey salt and vinegar discos, sob. Next up duty free. I wanted some new perfume and needed a new mascara so we got sniffing! 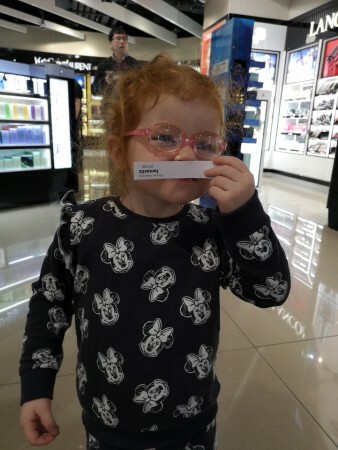 Charlotte LOVED smelling all the fragrances on the little cards. 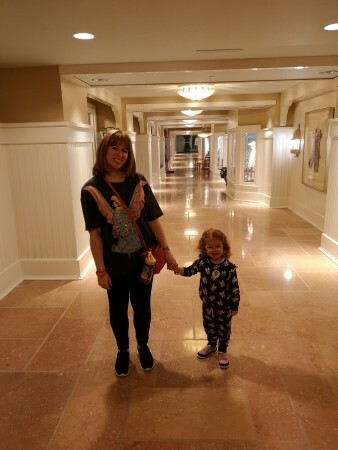 I think if we had stayed there for 2 weeks instead of going to Disney she wouldn’t have minded that much! I couldn’t make up my mind , and they had all started to smell the same so asked a really nice lady if she had any recommendations of things she thought I would like. She asked what perfumes I like (BonBon by Viktor&Rolf, Candy by Prada being 2 of my faves) She recommended the latest Hugo Boss fragrance which I loved, so that ended up being easy! The lady was heavily pregnant and so we chatted for a few minutes. Charlotte charmed her, as she does, and the lady went off and brought back a little pack of bracelets for her from one of the drawers at the bottom of the display cabinets. They were only little freebies I’m sure, but it was so sweet of her to do this and made Charlotte feel really special. I picked up a mascara and went to the tills. 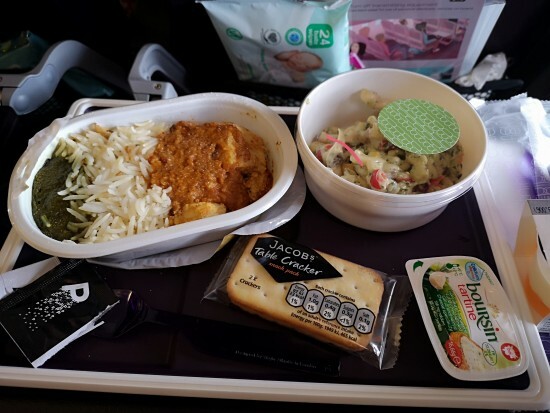 Once we were all paid up, we found a seat and I nipped into Boots as wanted to get a meal deal and some bits for Charlotte to eat should she reject the plane food with disdain as she did on our last trip! and I folded up the buggy to go in the plastic bag. Unfortunately I couldn’t get it to fit in so popped one of the wheels off, but the strip that the bag seals with was rubbish so I was a bit panicked when we got to Orlando we might be minus a wheel! By the time this was all done and we rearranged everything in the hand luggage our gate was announced (208) so we made our way down there. Charlotte decided sitting and being pulled along on her Trunki was the most fun which made this extremely short walk both long and painful. Every now and again she would go rogue and start pushing herself along, veering into people and shop displays. Super. By the time we reached the gate they were doing general boarding so we joined the line. At this point we were still carrying the bagged up stroller, so to say we were laden would be the understatement of the century! We were sitting in the Bubble, so headed up the stairs and found our row. 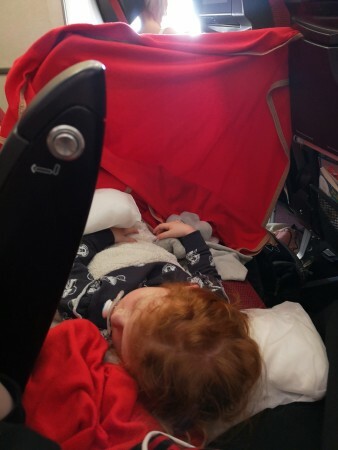 We stored the Trunki in the cupboard at the back and went to arranging all he bags we had amongst the overhead locker and under the seats in front. I was pretty gutted that the lockers that run down the sides of the bubble wouldn’t open! However these are still so useful as a ledge to put stuff on during the flight to have it to hand, so wasn’t a total write off. 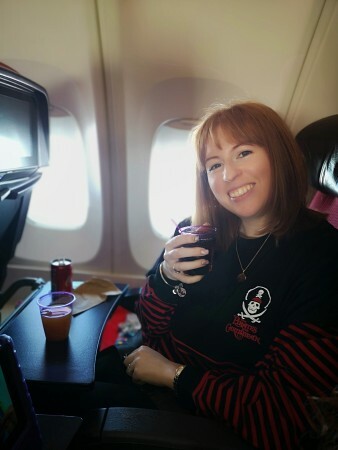 By the time the doors were all closed it became pretty clear that the flight was half empty, there were several empty rows in the bubble, and according to the flight crew downstairs was even emptier. We were delayed taking off by about 45 minutes due to the fog, I think the pilot said that they were landing lots of flights that had been stuck holding over the airport. I was really hoping that this extra 45 minutes being sat on the plane wasn’t going to mean that Charlotte got fed up and flipped out later on. 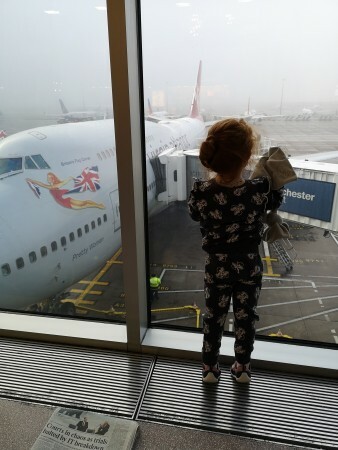 By the time we taxi’d for take off she was well into the in flight entertainment, and had watched the Gruffalo and was into Frozen. 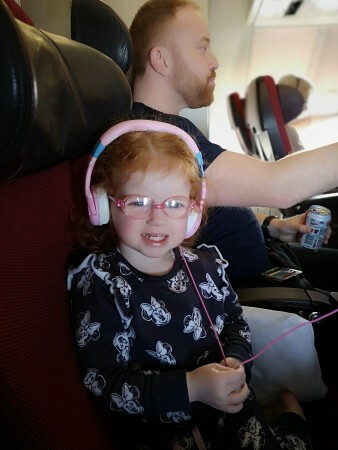 We had bought her some little headphones a couple of weeks prior and she was really good keeping them on. I did my usual trick of putting Snufflebabe on her chest, and I had a tissue with Olbas oil for children on that I kept wafting under her nose. 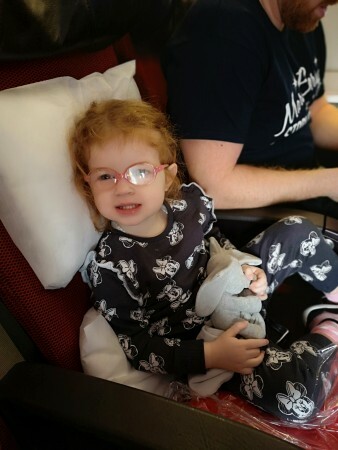 She didn’t seem fazed at all by take off, and we were soon settled in for the long haul. She enjoyed watching Elena of Avalor (for the first time) and some other videos I had saved onto her Kindle. 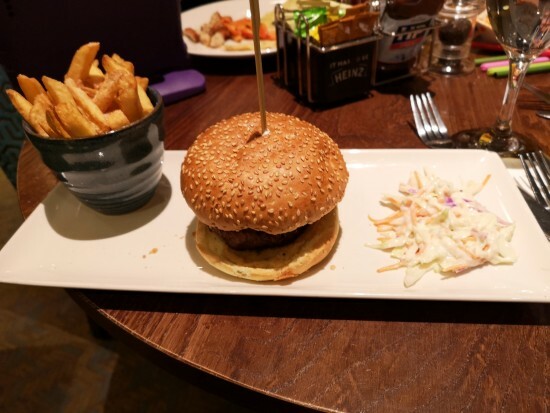 Dinner soon came and it appears I didn’t order a children’s meal (although I have a vivid memory of doing so). 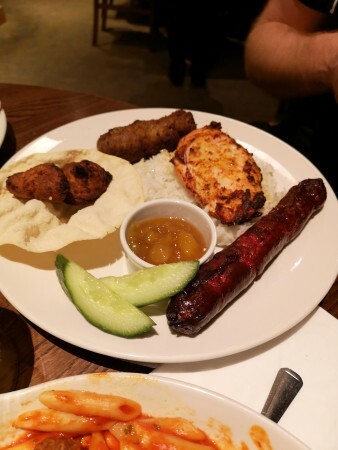 There was a cheese and tomato pasta on the menu anyway so I got her that, I had some form of chicken curry and I think Martin had sausage and mash. Charlotte didn’t eat much pasta but enjoyed the cheese and crackers and I gave her a some of one of the sandwiches I had bought instead. 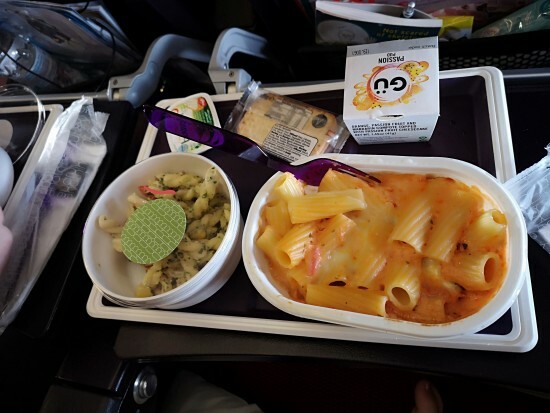 By the time they took all the empty trays away she was ratty and tired, and she had her first, and only, episode of whining and a bit of a cry. 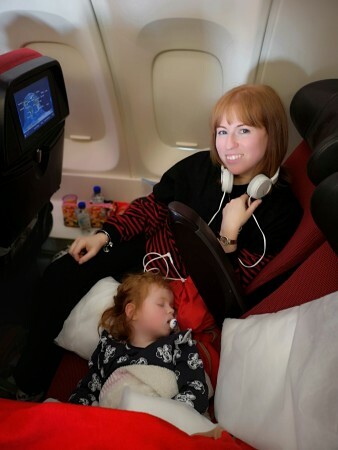 Because of the empty rows, Martin was able to move to an empty seat so she could lay down over 2 seats which was a bit more comfortable for her. I got her all cosy and fixed a blanket up so it wasn’t quite as bright, stroked her head for a couple of minutes and she was soon fast asleep. 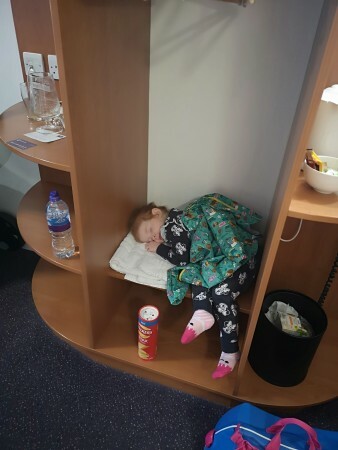 While she was asleep I listened to a couple of podcasts I had downloaded, Disney Dish and a couple of real crime ones about Escape at Dannemora which we’d just finished watching before we left. She had 2 and a half hours and woke up in a great mood. 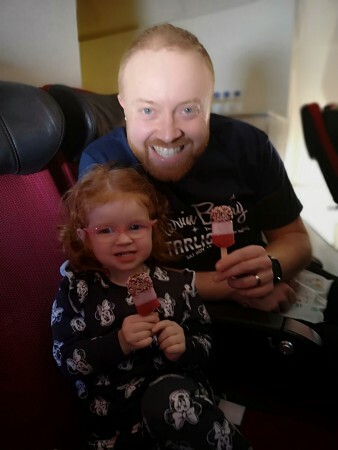 Very kindly the cabin crew brought her a little Fab ice lolly as she missed them during her nap. She thought this was great and really enjoyed it. 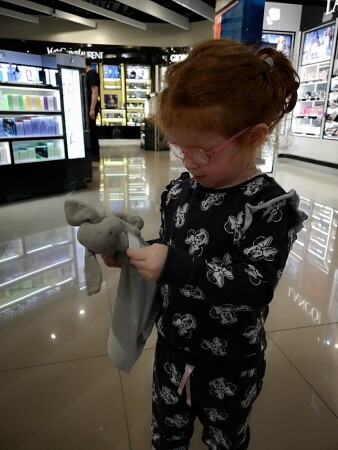 I had all kinds of stuff I’d packed to keep her entertained, so gave her a couple of little blind bag toys which she played with for ages, we did some colouring and fuzzy felts too. We had a bag of apple slices and some cookies. The flight went by in a flash and she was such a good girl. She was quite happy sitting in her seat playing and I was really proud of her. I had subscribed to Kindle Kids before the trip and put lots of little games and videos onto her kindle and she preferred this to the in flight entertainment. Landing was as non eventful as take off, she didn’t bat an eyelid. 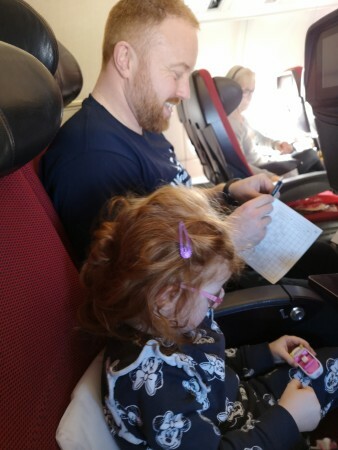 I was probably dreading Immigration more than the flight itself, so me and Martin were discussing strategy while we were sitting waiting for the seatbelt sign to go off. The US Government was still in shutdown at this point so we had no idea what we would be walking into. 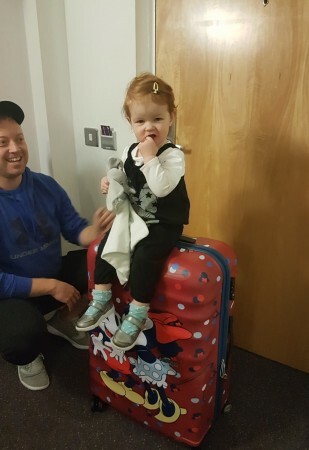 The cabin crew passed us the Trunki, we dished out the bags and I had hold of Charlotte. They held us for a few moments before letting us down the stairs. We power walked through…to an empty Immigration hall. I mean, actually empty. There was NOBODY in line, I have never ever seen it so quiet. Ironically the only reason we brought the Trunki was so if there was a big line Charlotte had somewhere to sit and watch her kindle or colour etc. I was so glad not to need it though! We didn’t use those automated machines this time so not sure if they’re no longer used. We were called up to a really nice officer. Martin had a Ric Flair T shirt on (a WWE wrestler) so he was chatting away with him about how he’d met him coming through the airport and he was a really nice guy! He wished us a nice holiday, and as we walked through and to the carousel we saw 2 of our suitcases plop onto it. Then the stroller (all wheels in the bag thank God!) and the next case followed in about 2 minutes! We couldn’t believe our luck. 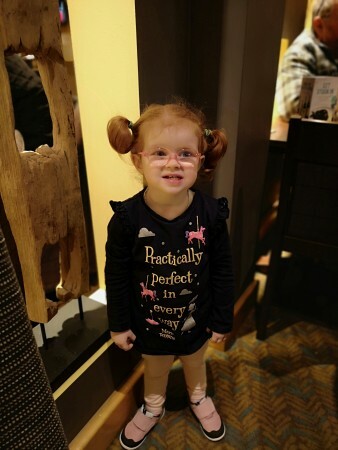 We got all our stuff sorted, popped Charlotte in the buggy and got ready to tackle the next obstacle – 2nd bag drop….Only this doesn’t seem to be here anymore either! There’s a lot of construction work going on, and it all looks veyy different after baggage claim. We were directed to a lift to take us up which we gladly did! Before we knew it we were at the monorail, and soon on our way to the Magical Express. 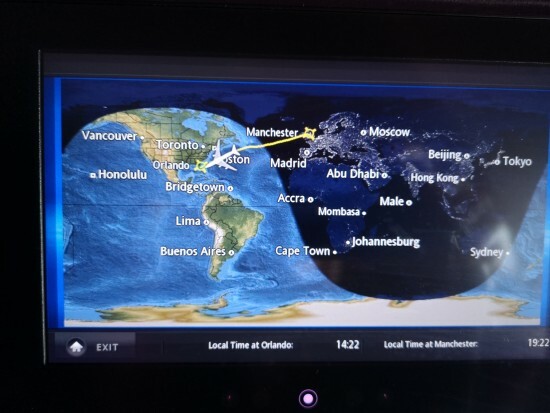 All told it only took an hour from landing to getting to the ME! It was our first time using the ME and it was great. A long trek to get to it, although not much further than the car hire desks to be honest. We decided to only rent a car for half this trip to see how we did and whether we could survive without one on future trips! Now that Disney are charging to park at the hotels, it's quite an expense if we don't use it much. 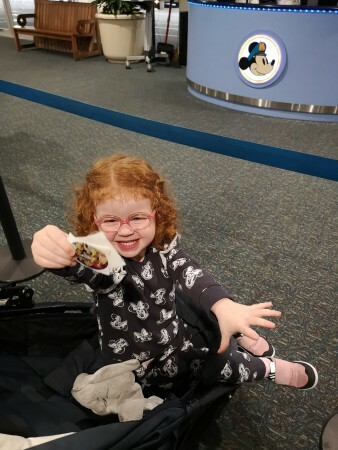 A nice cast member checked us in when we got there and gave Charlotte a bunch of Princess stickers. We were directed to a numbered lane and given a piece of paper with a barcode for the CM at the other end to scan. While we were waiting for a bus I connected to the Wi-Fi and sent some messages home to let people know we had arrived. 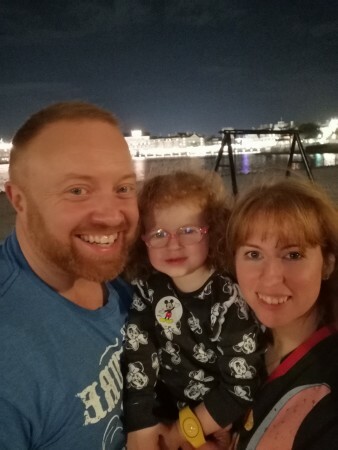 We only waited for around 10 minutes before a bus came for us, the driver told us we would stop at Caribbean Beach, Boardwalk and Yacht and Beach Club. Charlotte wanted her own seat so she sat with me and Martin behind. As we pulled away from the airport and the TV started playing videos of Walt Disney World I had a massive feeling of relief and excitement. I reached round to Martin and squeezed his hand and he just said “We did it”. 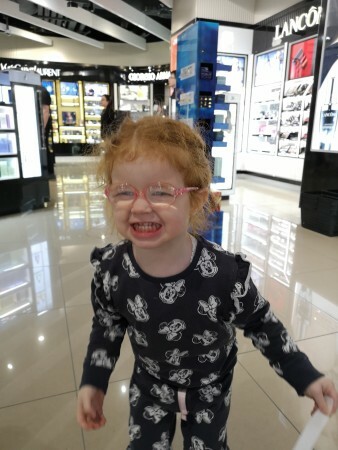 Even when you’ve done it before, the prospect of taking your 2 year old on a 9 hour plane journey, through 2 major airports is still a daunting one. 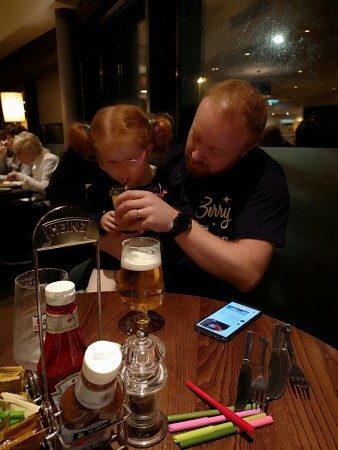 She did so well on our first trip, but older doesn't always mean better behaved and although we were optimistic she would be well behaved, it was lovely to be right and to finally be done with the majority of the travelling. It was only in that moment on that coach that I gave myself mental pat on the back, and finally relaxed. We pulled into Caribbean Beach first, wow the construction going on there is crazy! And it’s such a big resort, very pretty though. We stopped briefly at the front of the Boardwalk , then we were next! I can’t explain how amazing it was pulling up at the Beach Club. We wheeled all our stuff in and were checked in by a very nice, very tall cast member! We asked for bedrails for Charlotte’s bed and she said she would send someone up with them. Our room seemed a thousand miles away from the Lobby, but we just went the longest way around possible! We would figure out a much quicker route! We got to our room and it was gorgeous. I just realised I didn't take any pictures, sorry. I thought Charlotte would be flagging now but she got another wind and was bouncing off the walls with energy and excitement. I went out onto the balcony, couldn’t really see anything as it was dark by this pint, but then noticed fireworks and realised we had a great view of Illuminations! We watched for a while before going back inside. 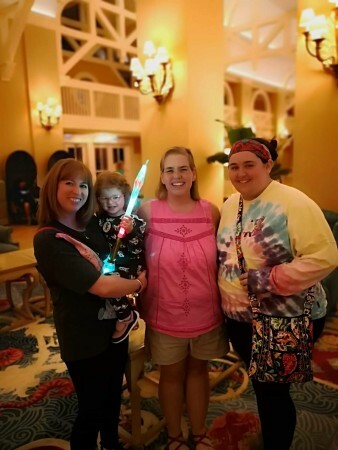 I checked my phone and had a message from Beth at Fairytale Personal Shopper to say she was in the lobby with our packages she had been holding for us. As we were about to go, the cast member arrived with the bedrails. He was really nice and chatted away as he fitted them for us. 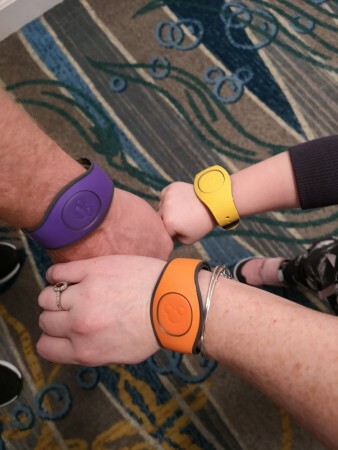 Once that was all sorted we put our magic bands on and made our way back down to the lobby. Beth and Paige were waiting for us and I gave Beth a big hug. They had brought Charlotte a gift which was a smash hit with her, and we had a nice chat for a few minutes. Beth is just the sweetest lady and it was so nice to see her. Martin took the bags of stuff she had brought up to the room while we chatted, before they headed home and we strolled onto the Boardwalk. 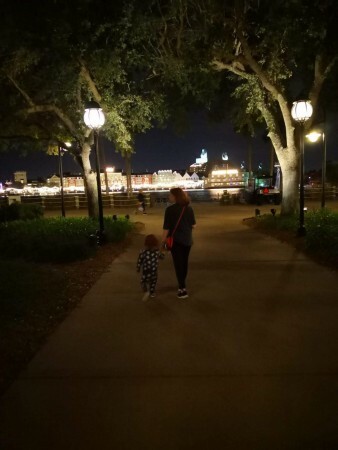 Seeing all the beautiful lights of the Boardwalk was amazing and we were just so happy to finally be there. We walked round to the Boardwalk Bakery, planning on getting something to eat but by the time we got there a wave of tiredness had hit me and I couldn’t face food! Martin didn’t want anything either so we just grabbed a muffin for Charlotte using our first snack credit and went back home. On the way back up I had a message from Instacart saying our groceries had been delivered, so Martin detoured to bell services to ask them to bring it up for us. We didn’t have loads, mainly fruit, milk, cereal, some still waters and some La Croix fizzy waters and some snacks such as crisps, raisins, little packs of cookies etc. Martin tipped the guy and I set Charlotte up with her muffin while we started unpacking. Soon it became clear that she was hitting a wall and she almost fell asleep sitting at the table. I popped her in her jammies and into bed, she was asleep within seconds. Martin and I got a load more unpacking done but I started feeling pretty sick, think it was a combo of tiredness and not eating very much through the day. There was only half a case left to unpack so we decided to leave it until the morning when we would no doubt be up around 3am! We fell into our lovely comfy bed and were also asleep within seconds! And we’re done. That was long to write, and probably longer to read so thanks if you got this far! 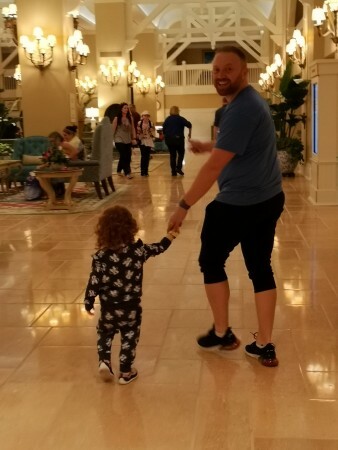 Tomorrow we’re off to Magic Kingdom (as is law on our first day) . Can’t wait to read this and see what you think of the beach club! Will be looking for tips for taking littler children! 2019 at the Beach Club! A great travel day. 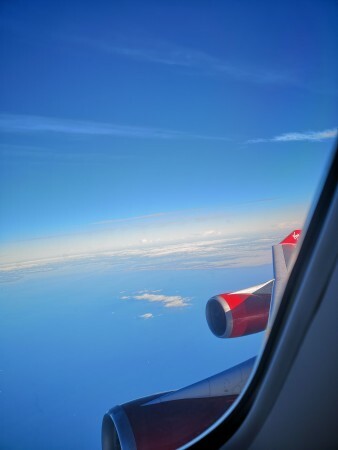 Don't you love that first evening when the stress of travel is over and you have the whole holiday to look forward to. Looking forward to reading along. Our DLP Holiday - May Half Term!